So why make grenadine? Your common run of the mill grenadine is chock full of artificial flavors and tastes nothing like pomegranate. This simply isn’t going to cut it. When you take the time to hand make a batch of grenadine it greatly improves the flavor profile of your cocktails. A lot of your older, more classic cocktail recipes call for grenadine and my mother always told me to respect my elders. So lets pay proper homage to the art of these cocktails, shall we? Pick up 6 Pomegranates. For the best deal, visit your local Asian grocery store (H-mart). If you don’t have an H-mart, Wegmans will do the trick. I juiced 6 pomegranates with a citrus press for approximately 2 cups of fresh juice. You could go cheap here and buy pomegranate juice, but make sure you adjust your sugar levels. Next add the 2 cups of juice and 2 cups sugar to a large pot. For a hint of raspberry and an added floral flavor, I steeped two bags of hibiscus tea in my batch for 10 minutes. If I could’ve found dried hibiscus flowers it would have been better, adding a wonderful floral note and red color. This is where you can get a little creative with your recipe. Instead of the hibiscus tea or dried flowers, sometimes I pick up orange flower water at an Indian grocery store. You’ll also be able to find pomegranate syrup there, which is an acceptable grenadine substitute in a pinch. After cooking the grenadine for 15 minutes, allow it to cool and bottle it up. You can also add a shot of vodka to help it preserve for a month. So I’ve made grenadine a couple times since this post and I should share my experiences. First thing is try and find dried hibiscus and cut out the tea. This will give the grenadine a nice deep color and flavor with floral and citrus components. I’ve also tried a shortcut and using 100% pomegranate juice and it really didn’t come close to the freshness from hand squeezing the pomegranates. Also try adding a little rose water to the grenadine after it has cooled. Hi Josh, I’m going to make the grenadine but unfortunately I have to substitute 100% pomegranate juice. You mentioned in the recipe to adjust the sugar levels.… By how much should I reduce (I’m assuming it would be a reduction) the sugar? Alison– It’s best to buy unsweetened pomegranate juice and then just treat it like a simple syrup. 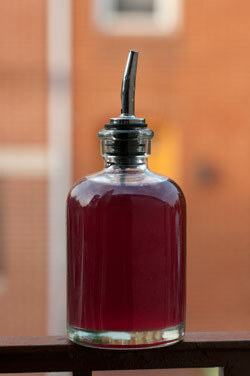 I started making my own grenadine when I started researching pre-prohibition drinks for a project I’m working on. Reading what grenadine was v/s what it now is, is enough to make you cry. I go along the same recipe as you. I use 100% juice since I can buy it by the case at local Indian markets cheaply (and don’t have a juicer…yet). I use hibiscus flowers which I get from either Penn Herb (brick and mortar in Philly or online at PennHerb​.com) or mail order from herbalcom​.com (only sell herbs by the pound but great prices). The part I’m still fiddling with is the sugar/sweetener. I don’t like a lot of sugar in stuff, that’s just me. 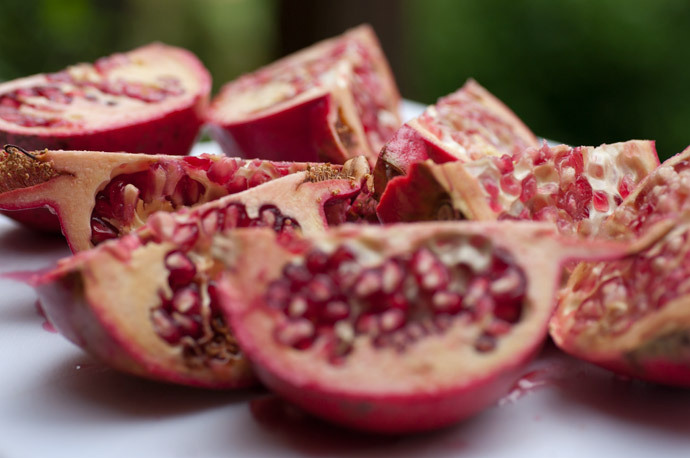 I make mine with just enough sweet to balance the tart of the pomegranate and hibiscus. So it’s not sweet like most people are accustomed, but has a much better flavor. The sugar aspect and thickening I’m trying to work out right now. I substituted a quarter cup of dried stevia leaves instead of the sugar and found it came out way too sweet. So I’m playing with that to get the right balance. Unfortunately, without the sugar it’s very wet. Next are playing with various thickeners to see what works to give it a nice thickness. Atalanta, If you wanted to thicken up your syrup try using xanthan gum. I use pomegranate molasses to thicken my grenadine, just boil down the pom juice with a little sugar and lemon juice until thick. I also use rose water but might have to give the hibiscus a try. I think I will be using some Hibiscus water that I have behind my bar, instead of Hibiscus tea. Any suggestions on how much I should use.? 1 or 2 barspoons?